The plant commissioning for the 250,0000-tpy complex of United Iron & Steel Company -UISC has been completed. Located in the industrial area of Abu Dhabi, the complex consists of an in-line push pull pickling line, a single-stand cold rolling mill, and a continuous galvanizing line to process both hot and cold rolled coils. The push pull pickling line processes hot rolled coils with thicknesses between 1.6 and 3.2 mm, in widths up to 1,320 mm. Final cold rolled and hot dip galvanized strip ranges between 0.2 to 2.0-mm-thick strip. Coating type is GI and coating range is total 50-275 gr/mq. 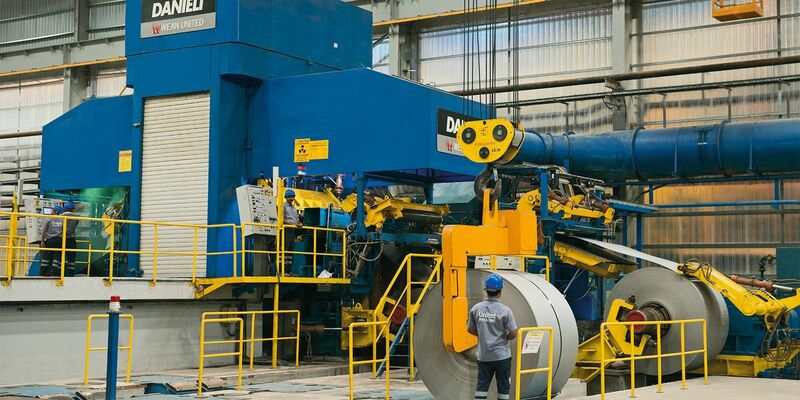 A cut-to-length line and a cold-rolled slitting line complete the new plant. The push-pull picking line will undergo capacity enhancements to process strip up to 4-mm. With the Danieli plant, UISC is confident to enter into new challenging markets.